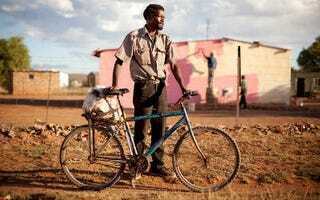 Photographers Stan Engelbrecht and Nic Grobler set out to document the burgeoning culture of bicycles in South Africa. After more than two years and over 4,000 miles on two wheels, the duo has compiled more than a hundred portraits of cyclists from across the country in Bicycle Portraits, a book project that has garnered more than $41,000 in financial support from three Kickstarter campaigns. From an 83-year-old nurse who cruises the streets of Pretoria to a bike enthusiast whose 1967 wheels still take him around town, Engelbrecht and Grobler profile an eclectic bunch to showcase the uniqueness of a growing phenomenon. Engelbrecht and Grobler's Bicycle Portraits is available for pre-order online. You can also donate to the photographers' project on Kickstarter.